There are already whispers of other EU member countries having their own referendums similar to the Brexit vote. 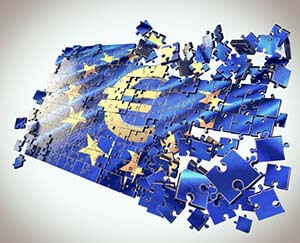 We spoke with Money Morning Capital Wave Strategist Shah Gilani to get his thoughts about what it would take for the EU to collapse. Gilani holds dual U.S. and British citizenship, and he voted in favor of Brexit. He's also known for successfully predicting geopolitical catastrophes like the 2007-2008 global financial crisis. His perspective is highly sought after by investors, Washington, and major financial networks. You see, the Bank of England makes up nearly 13% of the ECB's total capital structure (the money the ECB uses to fund its operations). By leaving, the UK will increase the financial burden of other member states, Gilani said. Specifically Germany and France, which make up 17% and 14% of the ECB's capital, respectively. The extra financial strain on these countries could cause serious resentment against the EU, mostly from the citizens of these countries. They will be the ones that have to absorb extra costs through increased taxes or decreased social services. And the ECB must replace the funding void left by the UK. "The ECB has been the glue that has kept the union together from a financial perspective," Gilani said. Without a stable balance sheet, the ECB cannot support the EU's most troubled member states: Portugal, Italy, Spain, and Greece. These states, also known by the acronym PIGS, have all received big bailouts in recent years. And they will undoubtedly require more help in the future, considering the Eurozone's tepid growth and the failure of negative interest rates to spark economic activity. Since last year, the EU has forced member states to take in a huge influx of Syrian, Afghani, and Iraqi political refugees. EU states received over 1.2 million asylum seekers in 2015, with more on their way in 2016, according to Eurostat. And Germany, Hungary, Sweden, and Austria have received about two-thirds of all the refugees. Many critics of this refugee wave cite a lack of assimilation among refugees as a big problem. Last New Year's Eve in Germany, there were a record 516 criminal charges – 40% of which were sexual assault cases, according to CNN. Among these charges, many were alleged to have been migrants and refugees, CNN reported. Elsewhere across Europe, other assault cases took place on New Year's Eve, too. Countries in the EU are limited by how much they can control their borders and immigration policies. In fact, the immigration policies of all EU countries are mostly set by Brussels, the de facto capital of the EU. Many member states are upset by how they can't control their own borders, according to Gilani. And that is causing serious ire against Brussels. Follow us on Facebook or Twitter.